Roosevelt Island's NYC Council Member Ben Kallos announced at last night's Town Hall Meeting the formation of a NYPD Explorers Program on Roosevelt Island for residents 14 - 20 years of age. The Law Enforcement Explorers Program is coming to Roosevelt Island in a partnership between the 114th Precinct, the Public Safety Department and Council Member Ben Kallos’ Office, it was announced today. After a 20-year-old was shot in the abdomen on April 25 in the Roosevelt Landings Complex, stakeholders came together to find a safe and productive outlet for young Roosevelt Islanders. 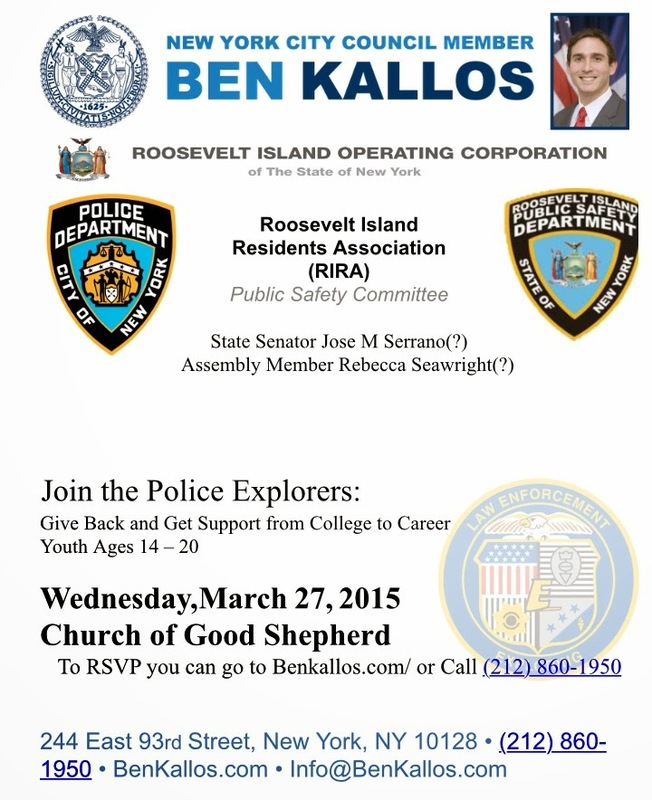 A May 27 event at Good Shepherd Center at 7 p.m., co-sponsored by Manhattan Borough President Gale Brewer, Assembly Member Rebecca Seawright, the 114th Precinct, RIOC and the Public Safety Department will introduce the community to the Law Enforcement Explorers and young people sign up. The NYPD Law Enforcement Explorers is an educational program for New Yorkers ages 14-20 aimed towards community service and laying the groundwork for a career in law enforcement. Students learn from the five experience areas: Life Skills, Service Learning, Character Education, Leadership Experience, and Career. Roosevelt Island youth will be transported to and from the 114th Precinct for the program, which will meet regularly. There are also opportunities to apply for additional programming. Each Explorer program has an Officer as an on-site Post Advisor, and there are about 4,000 posts across New York City. It only costs $24/year, which makes it a low-cost and effective way to prepare teenagers for college and career. "Mentorship and training from NYPD Law Enforcement Explorers is our answer to recent gun violence on Roosevelt Island. We are providing youth ages 14 to 20 with programming that will set them on a path to free or low-cost college and a career. Answering violence with compassion will lift our community and our youth,” said Council Member Ben Kallos. "We are excited to partner with our local elected officials and the 114th Precinct to bring the NYPD Explorers Program to Roosevelt Island. The initiative will help facilitate a broader understanding of law enforcement services and will provide for opportunities for our island youth to work closely with officers from our Public Safety Department and the NYPD. Participants will not only gain a working knowledge of law enforcement work, but will also have the opportunity to learn about the importance of service and giving back to their community,” said Charlene Indelicato, President and Chief Executive Officer, Roosevelt Island Operating Corporation. The NYPD Law Enforcement Explorers is one of the Department's best community programs geared towards our youth. The program is geared for individuals aged 14-20 looking to pursue a career in law enforcement. The 114 Precinct in conjunction with Councilmember Ben Kallos and Roosevelt Island Public Safety is very proud to host the first Roosevelt Island NYPD Explorer initiative. We are looking to target our Roosevelt Island youth. Anyone interested please join us on May 27,” said Captain Peter Fortune, Commanding Officer of the 114th Precinct. "During my tenure with the NYPD, I commanded three (3) Patrol Precincts, each of which had an Explorer Post, giving me an opportunity to see the benefits of Exploring first hand. A sense of belonging, accomplishment, and good citizenship are a few of those benefits. I look forward to working with our local elected officials, the 114th Precinct, and our Public Safety Department in affording this opportunity to the younger people of Roosevelt Island,” said John McManus, Roosevelt Island Director of Public Safety. “The RIRA Public Safety Committee supports the creation of services for this population, believing that if engaged in productive activities, with purposeful direction, there will be an improvement in the quality of life of all. We support this initiative,” said Erin Feely-Nahem, Chair of the Roosevelt Island Residents Association Public Safety Committee. and April 25 Roosevelt Island shooting at this previous post. Kallos flyer calls for meeting in the past, March 27. A typo? March 27, 2015 was a Friday. May 27, 2015 is a Wednesday. The meeting is on May 27. Kallos says it on video and in press release. The March date on flyer is incorrect.